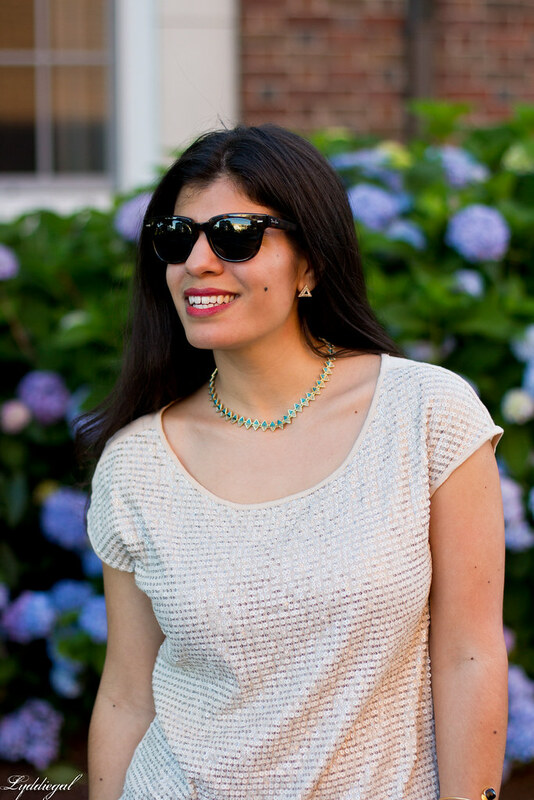 I appreciate the subtlety of this cream colored sequined tee - it feels light, summery, and very daytime friendly. With a blazer thrown over it, I wore it to work, and then in the evening, ditched the jacket and grabbed a fun clutch. 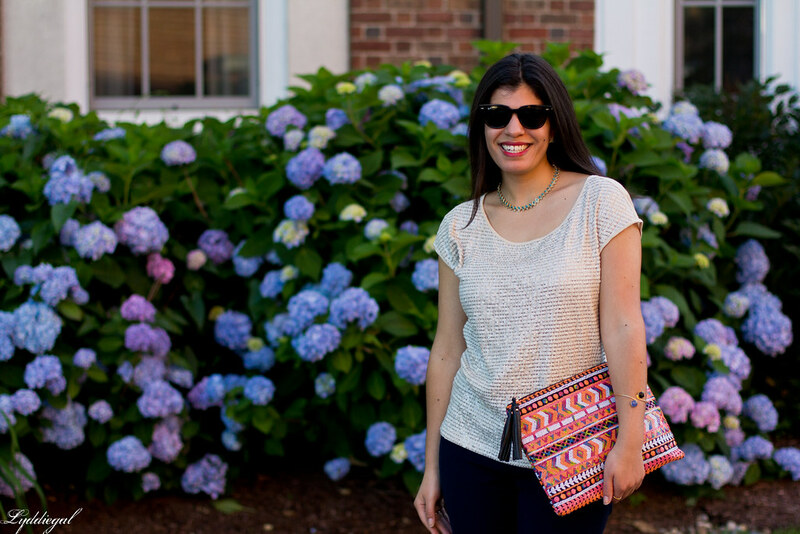 This sequined aztec clutch is my newest addition - I snagged it for a mere $10 at TJMaxx (about 85% off retail) though it's available at Amazon for a not-too-terrible $30. I finished off the look with my Rocksbox set - I really loved this House of Harlow necklace, the turquoise stones were lovely. I also enjoyed the Charlene K bracelet, though both pieces were $100+ and over my budget, so I did not keep them. Rocksbox is currently having a sample sale through the 14th and the necklace is there - reduced to $44 - only it's with black stones. Still a little tempting though. I don't know where to start with this look. I mean, that clutch is a seriously impressive piece, but the fact that you paid 85% off retail for it makes it even better. But then there's the necklace, which is so pretty when you get close to the turquoise but that I imagine is even lovelier in black. (Because it's me. And black. It's a really good thing that Rocksbox doesn't ship to Canada, the last thing I need is another necklace.) And then there's the fact that you so effortlessly paired a sequinned top with the bright sequinned clutch without looking unusually sparkly. And of course there is the pair of perfect navy trousers that I envy every time. Suffice to say - I love this outfit. That tee reminds me of a brown one i had that I recently let go of because i never wore it. Oh and there's that great clutch again, I love the size and colours. I can't believe that clutch was only 10 bucks! What a bargain! That clutch is so fun and the price is even better! The Rocksbox sample sale is definitely tempting...although I haven't bought anything yet. That clutch is everything, I need one in my life! I was about to start typing a series of comments and I then I saw Cee's post and, yeah, everything she said is ditto for me - you look perfect! I'm in love with this clutch! It's everything. 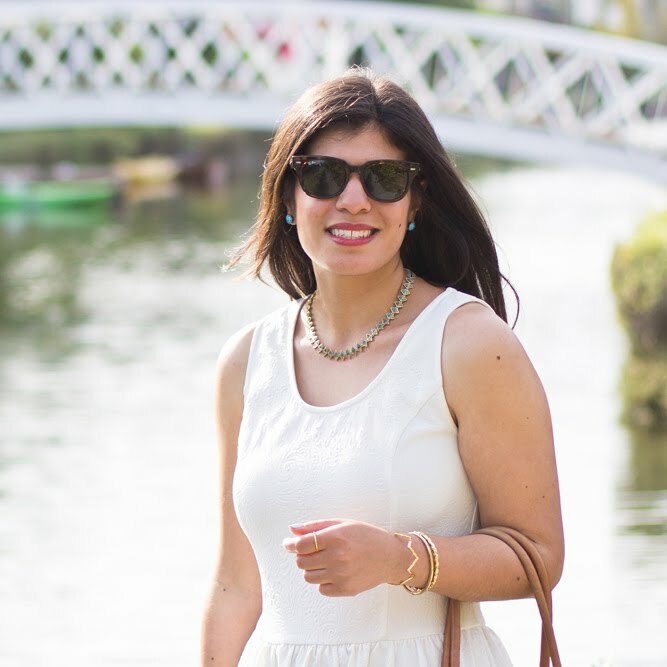 I love this daytime sequin look! That clutch is SO cute! I need one in my life! Ooh that clutch is such a showstopper, I love it. And $10?! Awesome. 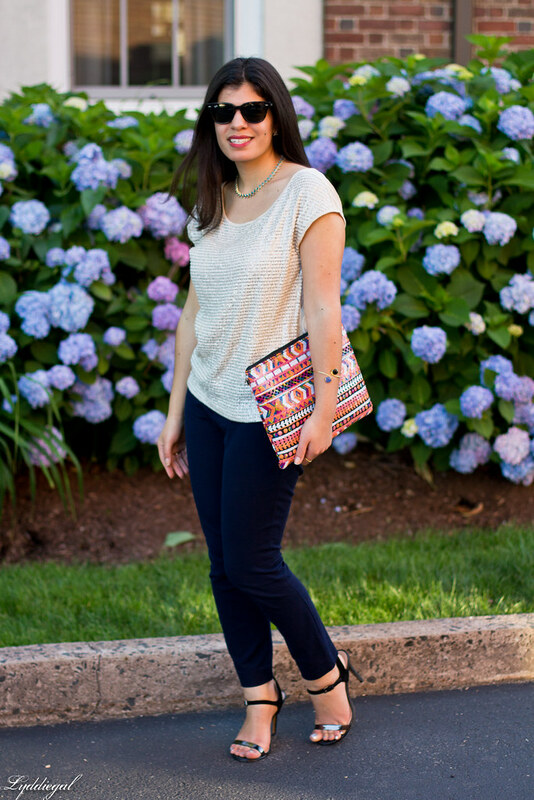 Love the sequin top too--it's subtle enough to totally work both day and night. I need more sequins in my life. 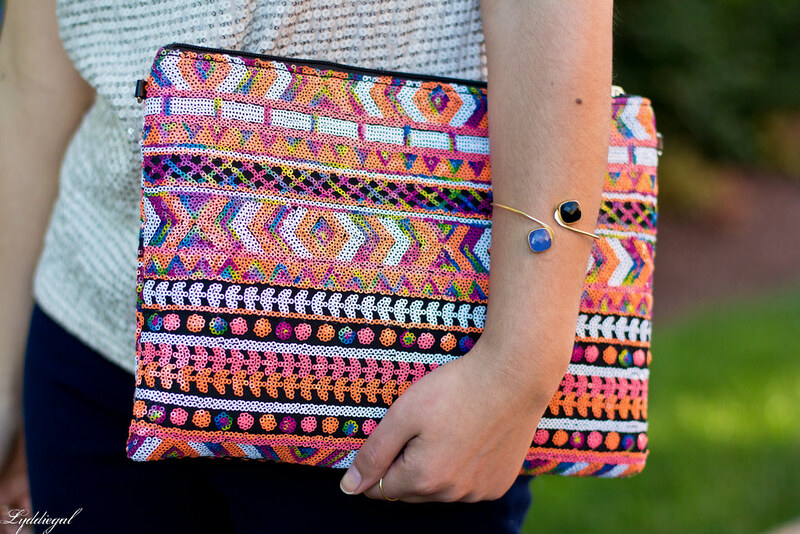 I just love all the colors in that clutch! Definitely a steal at only $10! It compliments your sequin top perfectly! I love your accessories, especially your jewelry! 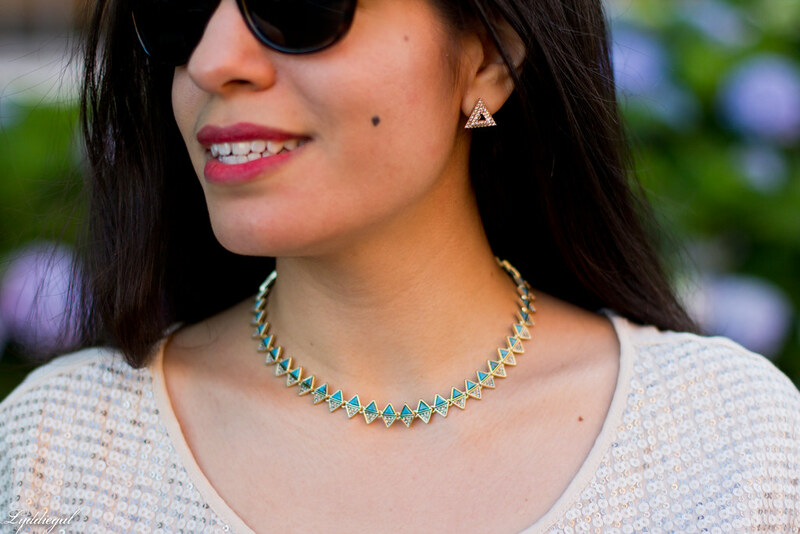 Gorgeous little accents that really add a fun pop to your outfit. Pretty tee. Love how the clutch stands out with this pairing. this clutch is everything, you look stunning as always. 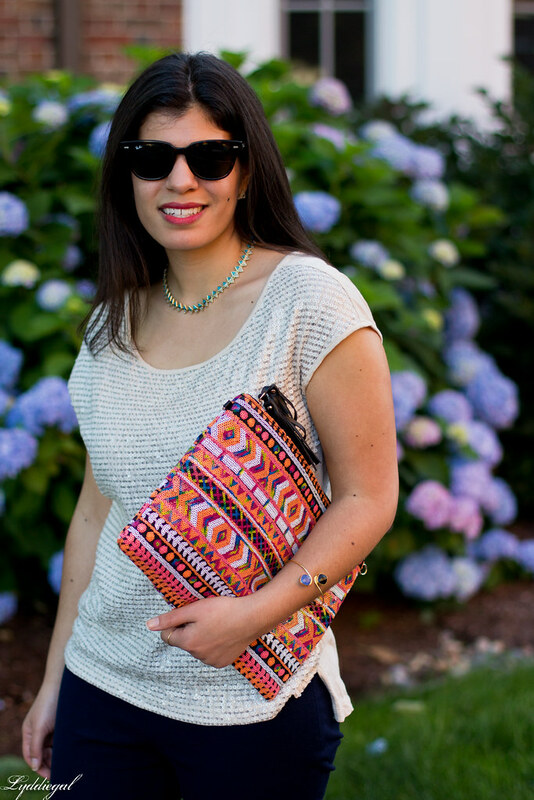 What a fantastic clutch, and the necklace is beautiful! That clutch is so fabulous. I love the bright colors and tribal print. 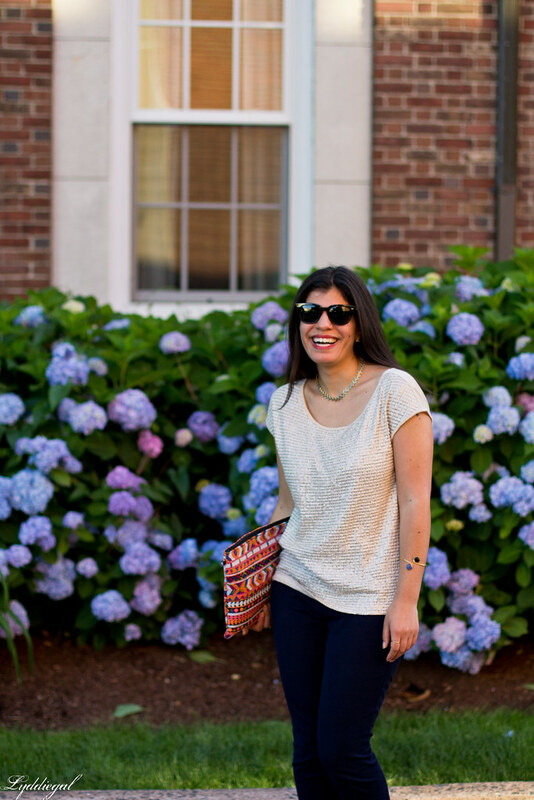 I love sequins for day and night! And that clutch is too cute! 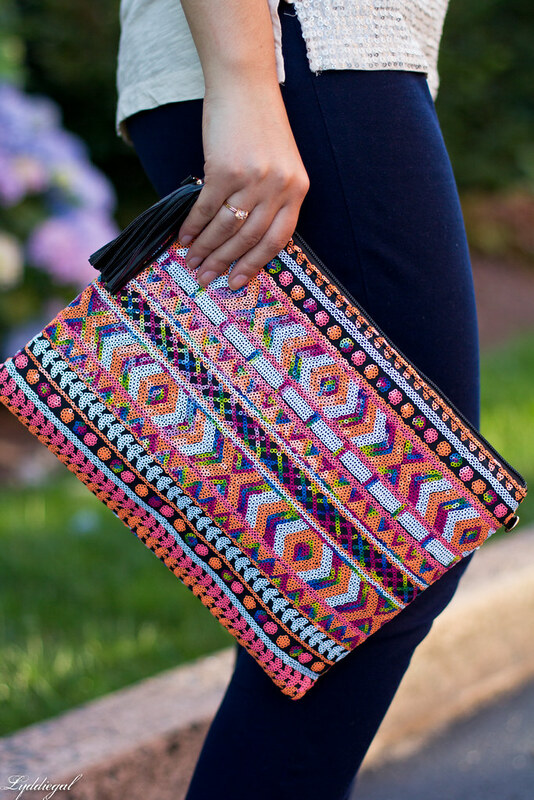 I have been wanting a fun colorful clutch - I think it's time I visit my local TJ Maxx. Amazing clutch! I love the colors on it! Great stylish look! Awesome pictures dear! That is definitely some day appropriate sequins, very fun!